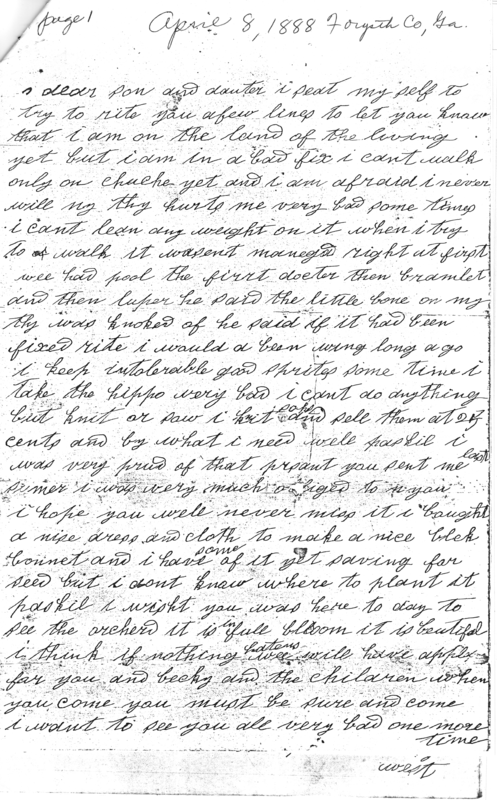 I’m so very excited to be posting the first in a series of four transcribed letters from the family of my 4th great-grandfather, George W. West (b. abt. 1819 in Spartanburg, SC – d. 1895 in Forsyth County, Georgia.) I received these letters from Ron West, a distant cousin I recently reconnected with. He’s of the Arkansas Wests and a descendent of Paschal P. West, the brother of my 3rd great-grandfather, Lightner West. He as kind enough to share original copies of these letters with me without me having to beg! Around the world, the first Whitechapel Murder had taken place just 5 days before on London’s East End. Nobody had heard the term “Jack the Ripper” yet. 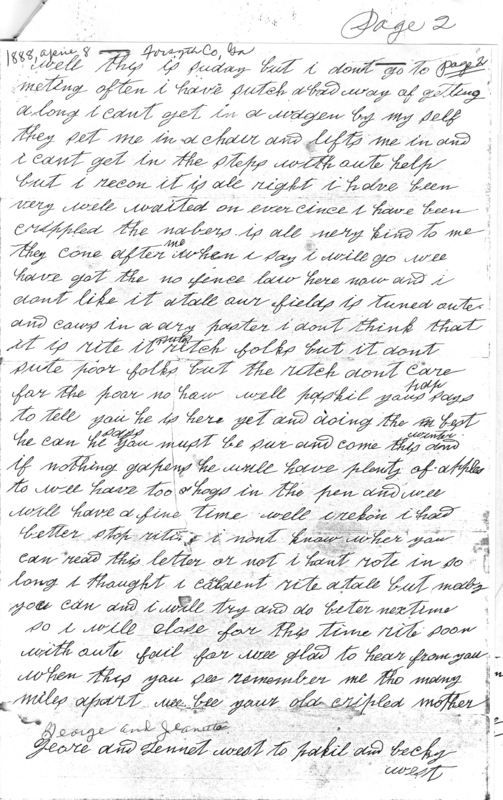 More locally, at the time of the writing of this letter, Jennet Cowen West was about 72 years old and living on a farm in Forsyth County, Georgia with her husband George, her daughter Edith (Edy), and Edith’s children. (Edith was married, but never moved away from home, even though they couple had at least 4 children — a fact that apparently caused her husband to eventually abandon the family for greener pastures in Arkansas, Oklahoma and Kansas.) George and Jennet’s son, George W. West, likely lived nearby at this time. Two of Jennet and George’s children, Paschal P. West (who married Rebecca Westray) and Sarah Jane West (who married Andrew H. McClure) had already “gone west” to Arkansas at this point. It’s because of that move that we have these letters from a mother to her oldest surviving son. A little history on Jennet: She was born in County Antrim, Ireland (now Northern Ireland) in about 1816 and immigrated with her family to South Carolina when she was about 4 years old. She spent her early life in Union County, South Carolina and married George W. West either there or in Spartanburg County, SC in approximately 1840. While still in South Carolina she bore their first 6 children, Lightner West (my ancestor), Sarah Jane West (McClure), Paschal P. West, William Russell West, George W. West, Jr., and Edith (Edy) West (Harris). I suspect she bore another child around 1852, who died. The family moved to Georgia in around 1853. A later document associated with George W. West’s Reconstruction shows that they lived somewhere in Georgia for approximately 1 year before settling in the northeast corner of Forsyth County, Georgia, in the Hightower District. They attended Concord Baptist Church in Forsyth County and possibly Hightower Baptist Church just across the county line in Cherokee County, Georgia. In Georgia, Jennet bore her other four children: Leander West, Elizabeth West, Monroe West and Mary Ann West. Jennet’s exact death date is unknown, but it is known that she survived at least two children, her son Lightner served in Company D, 56th Infantry Regiment (Georgia) and died at Tazewell, TN. It’s unknown whether he died from illness or battle, but I suspect illness. That same year, her youngest child, 3-year-old daughter Mary Ann West, died. This letter shows that Jennet was in poor health. As I mentioned, I’ve never found a record of her death, but her husband George remarried in January 1892, so I suspect she passed away sometime around 1890 or 1891 – around the same time that three of her grown children passed away in what I suspect may have been an illness. No pictures exist (that I know of…yet!) 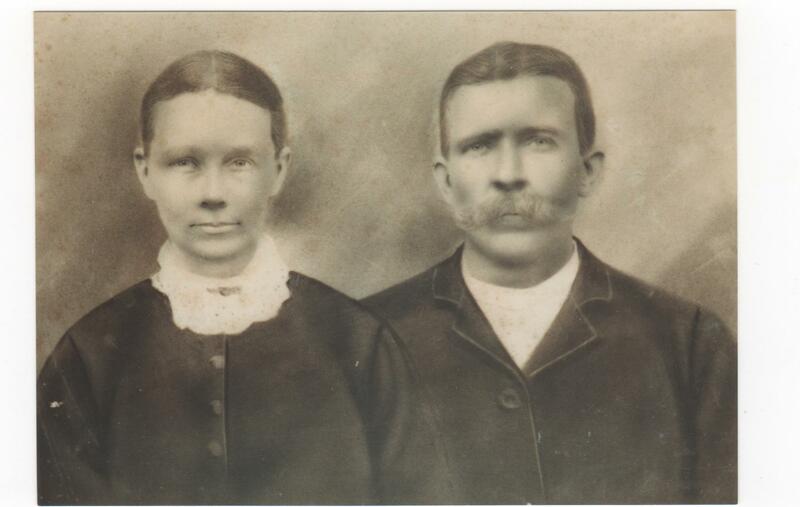 of George and Jennet Cowen West, but judging from pictures of their children and grandchildren, as well as their living relatives today, I suspect they were fair with light-colored eyes. I seat myself to try to rite you afew lines to let you know that I am on the land of the living yet, but I am in a bad fix. I can’t walk, only on cruches yet and I am afraid I never will. My thy hurts me very bad. Some times I can’t lean any weight on it when I try to walk. It wasent managed right at first. We had Pool the first doctor, then Bramlet and then Luper. He said the little bone on my thy was knocked off. He said if it had been fixed right I would have been wing [walking?] long ago. I keep in tolerable good sprites. Sometime I take the hippo very bad. I can’t do anything but knit or saw [sew]. I know soks and sell them at 25 cents and by what I need. Well, Paskill, I was very proud of that present you sent me last summer. I was very much obliged to you. I hope you will never miss it. I bought a nice dress and cloth to make a nice black bonnet and I have some of it yet saving for seed, but I don’t know where to plant it. Paskill, I wisht you was here today to see the orcherd. It is in full bloom. It is beautiful. I think if nothing hatens [happens] we will have apples for you and Becky and the children when you come. You must be sure and come. I wont to see you all very bad one more time. Well, this is Sunday but I don’t go to meeting often. I have sutch a bad way of getting along. I can’t get in a wagen by myself. They set me in a chair and lifts me in and I can’t get in the steps withoute help, but I recon it is all right. I have been very well waited on ever since I have been crippled. The nabers is all very kind to me. They come after me when I say I will go. Wee have got the no fence law here now and I don’t like it atall. Our fields is turned oute, and cows in a dry pastur. It suits ritch folks, but it don’t suite poor folks, but the ritch don’t care for the poor no how. Well, Paskill, your Pap says to tell you he is here yet, and doing the best he can. He says you must be sur and come this winter and if nothing happens he will have plenty of apples, to. Wee have two hogs in the pen and wee will have a fine time. Well, I rekon I had better stop writing. I won’t know where you can read this letter or not. I hadn’t rote in so long I thought I couldn’t rite atall but maybe you can and I will try and do beter nextime. So I will close for this time. Rite soon with oute fail for wee glad to hear from you. When this you see remember me, though many miles apart. Wee be your old crippled mother. I love this long letter! There’s so much interesting info in here. 2.) An Unknown Bramblett or Bramlett (The Wests lived near what is now Dr. Bramblett Rd.) Bramblett is a popular name around that area and the family appears to have been on the wealthy side. I have a picture of another of my other senior citizen ancestors (above in my blog’s header photo) wearing a black bonnet in the mid-1890’s. Stylish! They attended Concord Baptist Church, where their daughter Mary Ann was buried, and where their children Monroe and Edith were later buried. I wonder why Jennet doesn’t mention George going to church with her? I always had the impression that he was a rather severe and religious man, but maybe he didn’t go? It was also springtime, so perhaps he was busy. The following research and info is based heavily on The Roots of Southern Populism: Yeoman Farmers and the Transformation of the Georgia Upcountry, 1850-1890 by Steven Hahn. (New York: Oxford University Press, 1983.) Any mistakes are my own and I’d be happy to be corrected. The No-Fence Law was a deliberate misnomer, for one thing. In fact, the No-Fence Law required George and Jennet and other smaller landowners at the time to fence in their livestock. You have probably heard of the “Fencing of the West,” but you may not know that the South was also fenced in. I sure didn’t. I just researched all of this in the last few days so I may get some of it wrong, but my understanding is that before the 1870’s, custom was to let hogs, cows, sheep, etc. roam about freely. It was a planters job to fence in his crops to protect them from marauding animals. This did cause some problems (the Hatfield & McCoy feud started off over the killing of a free-rambling hog), but it also allowed the animals to get some good eating and fatten up wherever they could. After the Civil War, the South’s economic situation changed, and the empty countryside – where domesticated creatures roamed at will – started to fill in. Small subsistence farmers like George and Jennet West and their family started to bump up against planters struggling to cultivate their crops at pre-slave labor levels. In the 1870’s, the “ritch folks” decided it no longer suited them to fence in their crops when they could simply require the poor folks to fence in their animals instead. So here comes the “No-Fence Law.” It was called by this name on local ballots, but what it really meant was that large land-owning planters were no longer required to fence in their land. Instead, George and Jennet’s cows were stuck being fenced in a dry pasture. This whole thing got so absurd that at one point there was a law on the books in Georgia that if you lived in a “no-fence” county that bordered on a county that didn’t require livestock to be fenced in that you could actually build a gate or fence at the county line. You just had to maintain it and allow people to pass through freely from both sides. And if you did build such a fence, anyone leaving the gate open would be charged with a misdemeanor. I can only imagine fences being erected willy-nilly at county lines while confused cows wandered about looking for something to drink. As it turns out, the class struggle that erupted with the “No-Fence Law” was responsible for turning many Southern farmers to the nascent Populist movement. Jennet didn’t live to see the two elections where Populists on the national presidential ballot. (She wouldn’t have been able to vote in them if she had.) I wonder if George voted for Weaver in 1892? It’s also nice to know that my 4th great-grandmother had “ritch folks'” number. To sum up, this was an awesome find and I’m excited to transcribe the other letters and share them here. If you’re a relative or just want to say hi, leave a comment or Contact Me. Until next time, stay tuned and happy detecting! Previous Post I’ve Located Letters from my 4th Great-Grandparents! I believe I am a distant relative. My grandfather was Manley Dophus West and my grandmother was Willie Goff West. My father was Hershel Benjamin West. I am just beginning my quest into this side of my family history. I have been receiving your newsletters for a few months now. This letter brought tears to my eyes. My grandpa didn’t speak much about his family so we are so anxious to learn what we can. Thank you for your work and dedication to our family history. I am excited to read the next letter. Yes we are! We are very much related! We’re 3rd cousins 2x removed (LOL). It’s so exciting to be able to help fill in the gaps! I think it’s so sad that we have lost touch with our Wests. And it was often due to death. A lot of our West men died young. My grandpa West’s great-grandfather died young, then his father died young, too, and that created a lot of disconnect among the old folks about their family history. I’m glad we’re finally putting it all back together again and finding each other, even halfway across the country! Could the “hippo” she refers to be shots? If you pronounce it hi(long i)ppo, it sound’s like hypo(hypodermic) needle. Hi Jennifer, my name is Mary Louise West, second born to Herschel and Vera West, my grandfather , Manley Dophus West , he. talked only about a brother George and a sister, can’t recall her name, and a brother he called Roscoe, grandpa did not talk about where he came from or anything about family. He was the most gentle and generous person I have ever known, he lived with us from the time I was in first grade and that was a long time ago, Inam now 73. grandpa passed in 1962. It’s so nice to meet another cousin! I think “gentle” and “generous” run in the family. My 89-year-old grandfather is the most gentle and generous person I know! I’m going to write you an email. I was hoping maybe you had a picture of your grandfather for me to add to my family tree. I love seeing the family resemblances!